A wrist fracture is a break in one, or both of the forearm bones that make-up the wrist. The near bones that make up the wrist joint include the radius and ulna. The radius bears most of the weight of the wrist joint. The carpal bones that articulate with the radius include the scaphoid and lunate. In the wrist, the ulna bears only a small portion of the weight. A wrist fracture occurs as a result of a trauma, usually a falls onto an outstretched hand. Pain, swelling, bruising and a loss of motion are common complaints. A deformity of the wrist may be present. Examination of the wrist reveals pain with palpation. Displaced fractures may be associated with a visible deformity. X-rays will confirm a fracture. Further imaging may be required depending on the complexity of the fracture. 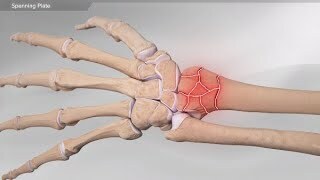 Fractures of the wrist that are not displaced can be treated non-operatively. The patient is placed in a cast for 6 weeks or more. Physical therapy may be started upon cast removal to help the patient regain strength and motion. 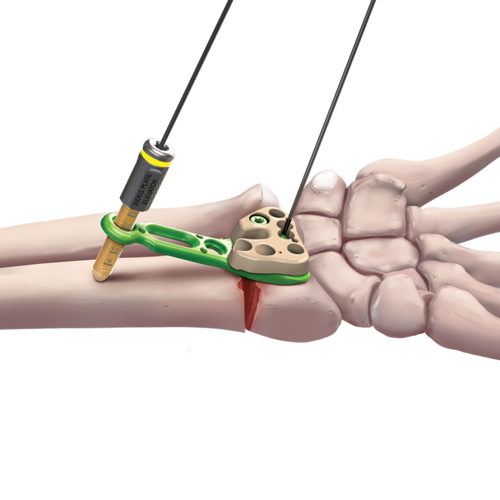 Fractures of the wrist that are significantly displaced are treated with surgical intervention. The surgeon fixes the bone by reducing or setting the fracture. 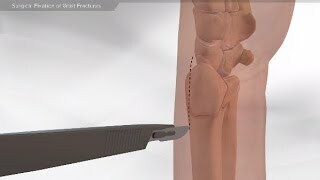 Based on the configuration of the fracture the surgeon may use multiple means to reduce the fracture including: wires, a plate, screws or an external fixator. An external fixator is a device composed of pins, rods and clamps that are drilled into the bone and extend outward through the skin. 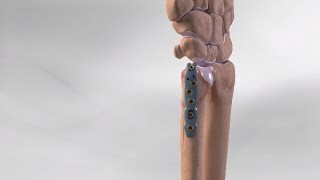 Rods and clamps are used to hold the pins together and support the fracture fragments.